February 2013 – Next Hipster Trend is what's HAWT, NEXT! Wait!! Maybe it’s not over … perhaps you can accessorize! That’s the only chance of resurrecting this tired to-do. If you must swim, get yourself some water wings , or at the very least a kickboard . To be ironic you can paint it with a micro-mural of David Hasselhoff doing some Baywatch-style beach-running. Sweet idea! Damn, I’m amazing. With ideas like this, swimming is coming back. As we recommended only nine days ago, 1920’s era swimwear is a must. Avoid Ken and Barbie-esque flippers and/or snorkel. Every normal has gone snorkeling by now and there’s nothing even remotely discussion-worthy in the sad, sad waters of your local lake in comparison to the ocean coral reefs that many normals have undoubtedly explored. Another important subject is HOW you should actually swim. Please don’t do an Australian crawl or an oft-overused elementary backstroke. Branch out into obscure strokes that nobody has heard of (that’s like our mantra, right) bust out the corkscrew, sometimes called the “newfie”, and wow the onlookers. “What’s he doing? !” they’ll say! You’ll soak up all the attention at the co-op’s free swim solstice parties. For ultimate conversation generation, other “hip” strokes include: Feet First Swimming (used to show off your latest pair of toe shoes) and the Combat Sidestroke. You can assert that you’re taking swimming back from the military industrial complex! You’re blowing their normal minds! You’ll love this. Wait!! Maybe it’s not over … perhaps you can accessorize! That’s the only chance of resurrecting this tired to-do. If you must swim, get yourself some water wings , or at the very least a kickboard . To be ironic you can paint it with a micro-mural of David Hasselhoff doing some Baywatch-style beach-running. Sweet idea! Damn, I’m amazing. 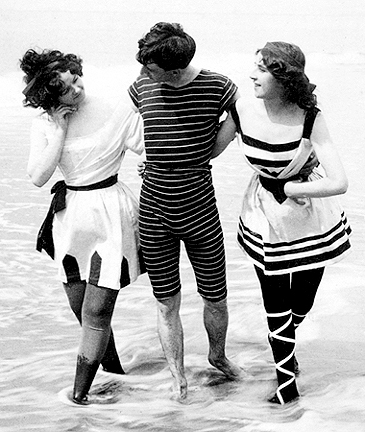 As we recommended only nine days ago, 1920’s era swimwear is a must. Avoid Ken and Barbie-esque flippers and/or snorkel. Every normal has gone snorkeling by now and there’s nothing even remotely discussion-worthy in the sad, sad waters of your local lake in comparison to the ocean coral reefs that many normals have undoubtedly explored. Another important subject is HOW you should actually swim. Please don’t do an Australian crawl or an oft-overused elementary backstroke. Branch out into obscure strokes that nobody has heard of (that’s like our mantra, right) bust out the corkscrew, sometimes called the “newfie”, and wow the onlookers. “What’s he doing? !” they’ll say! It’s very effective at getting a lot of attention at the co-op’s free swim solstice parties. For ultimate conversation generation, other “hip” strokes include: Feet First Swiming (used to show off your toe shoes) and the Combat Sidestroke. You can assert that you’re taking swimming back from the military industrial complex! You’re blowing their normal minds! You’ll love this. As far as actual technique, NHT suggests changing up strokes frequently. Alternating stroke by stroke between front crawl and back stroke is called a corkscrew or “newfie.” It’s very effective at getting a lot of attention at the co-op’s free swim solstice parties. For ultimate conversation generation, other “hip” strokes include: Feet First Swiming (used to show off your toe shoes) and the Combat Sidestroke. You can assert that you’re taking swimming back from the military industrial complex! Another important subject is HOW you should actually swim. Please don’t do an Australian crawl or an oft-overused elementary backstroke. Branch out into obscure strokes that nobody has heard of (that’s like our mantra, right) bust out the corkscrew and wow the onlookers. “What’s he doing? !” they’ll say! You’re blowing their normal minds! You’ll love this.